I love trying brands that are new to me, today’s review is on a selection of products from Amika and why I think you should give them a look if you are looking to try something new. Amika haircare are a brand I’ve heard of before but it was always in the states and not something we have access to here. But recently Sally’s has taken on Amika and they are available exclusively with them. I’ve been trying out 4 products from the range for a few weeks now and wanted to share my thoughts on them as I’ve been a little bit smitten! This review is based from a professional point and also a personal one. If there is 2 products I ever reach for on an almost daily basis its dry shampoo and dry conditioner. Not many people know about dry conditioner but this product can be great for adding softness and shine back into hair and is better (I’ve found) on finer hair if you don’t want to add an oil (Argan, Moroccan, Coconut)to smooth it out and weigh it down. Although I would never use this type of product at the roots, its perfect for midlengths and ends. The Amika Silken Up Dry Conditioner is definitely one of the better ones I’ve used. Its completely weightless and adds a beautiful gloss to my hair (Especially if I’ve used too much dry shampoo and its on the ends of my hair or a mattifying texture spray) without weighing it down or messing with the style. This product is also great on clients after a blow dry if they have had a colouring process and their hair is feeling a little dry still. I also recommend it sprayed throgh a bristle brush to tame fly-aways. If you were going to try only a few products in this range, I would highly recommend this one as its definitely a favourite of mine. Since texture sprays hit the market I’ve tried a good handful of them. I prefer them to sea salt sprays as I find them less drying and they work instantly for adding texture to clients hair to give them that ‘undone/messy’ look. The Amika Un.Done Texture Spray is quite concentrated compared to others. This is great as it means you end up using less product so it lasts longer. I also loved the aroma of this product. As with all texture sprays unfortunately I do find that the morning after you either have to ‘messy bun’ it or wash your hair, however I did manage to brush this one out quite well and it didn’t matte my hair out too much either. I did really enjoy using this product but generally only use a texture spray twice a week (Usually on second day hair) and was impressed with the results. In the words of the Teen Angels in the Captain Caveman Cartoon (Yes I am showing my age! ), WOWZERS CAVEY! This product totally rocks! I literally am in love and I’m not just talking about my own hair here. I’ve also used this on a few others hair too and I can’t fault it! The Amika Bombshell Blowout Spray is one of those products I wish I’d had back when I first trained as a hairdresser, it would have made my life so much easier! I love mousse for blow dries and adding volume but it can be a bit weighty at times and you are often left with product build up. This product is weightless, you literally can’t tell its on the hair. I use this product on both dry hair and damp hair and the results are great. Just sectioning the hair and giving it an even spray, then blow drying with a nice large round brush adds loads of volume and it holds. I love that it doesn’t add that ‘product’ feeling to the hair and the fact it works as a heat protectant means you are getting that additional protection. This is also great for using on dry hair when you want to re-style. I often use this before curling my hair when I add some volume at the roots quickly with a round brush. I can’t recommend this one enough, I really love it and feel due to the small amount you use (About 3 sprays on my shoulder length hair per time) its going to last a good time too! Lastly and by no means least we have the Amika Touchable Hairspray. Now, I don’t use a lot of hairspray on my own hair, I’ve never really found I need it but have been using this recently to spray the sections I’ve curled while they set when I am doing messy waves. I’ve tried this out on my own hair and daughters too. I don’t find I get product build up with this at all and you don’t get that nasty feeling to the hair and stiffness. Its not an ultra strong hold, but if you are wearing glamour waves for an evening or want to keep your hair style with a natural finish, then I would recommend this hairspray. The only thing I wasn’t keen on with this one was that it was quite heavily fragrances, more so that the other products. The fragrance is nice though, but it was a bit overpowering, so bare that in mind. However, when it comes to results I can’t question this hairspray at all as it certainly performs. So, that concludes my introduction to the Amika range and I’ve definitely been impressed. My hairs looked great and everyone’s been happy with the results. I would definitely look at other products in the range now as if they are half as good as these, I would be dissapointed! 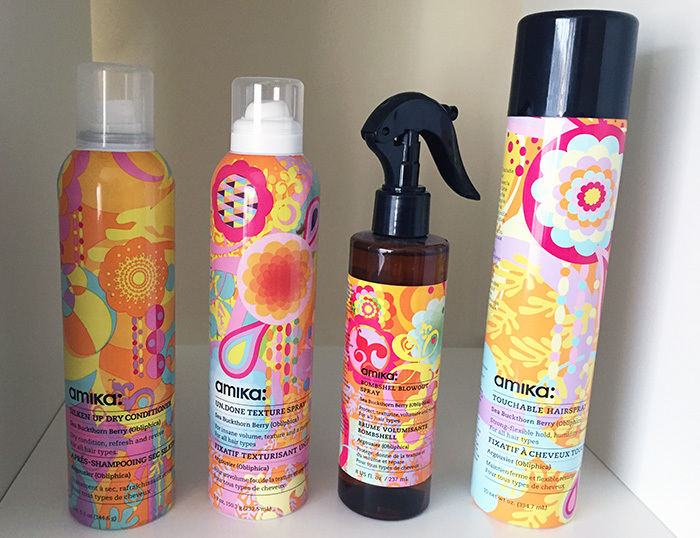 The Amika Hair care range is available exclusively in the UK at Sally’s.